Using the right approach can make GUIDs nearly as fast as integer primary keys on almost any database system. This article outlines an approach for using GUID values as primary keys/clustered indexes that avoids most of the normal disadvantages, adapting the COMB model for sequential GUIDs developed by Jimmy Nilsson in his article The Cost of GUIDs as Primary Keys. While that basic model has been used by a variety of libraries and frameworks (including NHibernate), most implementations seem to be specific to Microsoft SQL Server. This article attempts to adapt the approach into a flexible system that's can be used with other common database systems such as Oracle, PostgreSQL, and MySQL, and also addresses some of the eccentricities of the .NET Framework in particular. Historically, a very common model for database design has used sequential integers to identify a row of data, usually generated by the server itself when the new row is inserted. This is a simple, clean approach that's suitable for many applications. However, there are also some situations where it's not ideal. With the increasing use of Object-Relational Mapping (ORM) frameworks such as NHibernate and the ADO.NET Entity Framework, relying on the server to generate key values adds a lot of complication that most people would prefer to avoid. Likewise, replication scenarios also make it problematic to rely on a single authoritative source for key value creation -- the entire point is to minimize the role of a single authority. One tempting alternative is to use GUIDs as key values. A GUID (globally unique identifier), also known as a UUID, is a 128-bit value that carries a reasonable guarantee of being unique across all of space and time. Standards for creating GUIDs are described in RFC 4122, but most GUID-creation algorithms in common use today are either essentially a very long random number, or else combine a random-appearing component with some kind of identifying information for the local system, such as a network MAC address. GUIDs have the advantage of allowing developers to create new key values on the fly without having to check in with the server, and without having to worry that the value might already be used by someone else. At first glance, they seem to provide a good answer to the problem. Pretty simple so far: the rows are stored in order according to the value of the ID column. If we add a new row with an ID of 8, it's no problem: the row just gets tacked on to the end. Rows 7 and 8 have to be moved down to make room. Not such a big deal here, but when you're talking about inserting something into the middle of a table with millions of rows, it starts becoming an issue. And when you want to do it a hundred times a second, it can really, really add up. And that's the problem with GUIDs: they may or may not be truly random, but most of them look random, in the sense that they're not usually generated to have any particular kind of order. For that reason, it's generally considered a very bad practice to use a GUID value as part of a primary key in a database of any significant size. Inserts can be very slow and involve a huge amount of unnecessary disk activity. So, what's the solution? Well, the main problem with GUIDs is their lack of sequence. So, let's add a sequence. The COMB approach (which stands for COMBined GUID/timestamp) replaces a portion of the GUID with a value which is guaranteed to increase, or at least not decrease, with each new value generated. As the name implies, it does this by using a value generated from the current date and time. Note that the values aren't in any particular order and appear essentially random. Inserting a million rows with this type of value as the primary key could be quite slow. The first block of digits has been replaced with an increasing sequence -- say, the number of milliseconds since the program started. Inserting a million rows of these values wouldn't be so bad, since each row would simply be appended to the end of the list and not require any reshuffling of existing data. Now that we have our basic concept, we need to get into some of the details of how GUIDs are constructed and how they're handled by different database systems. Data1 is four bytes, Data2 is two bytes, Data3 is two bytes, and Data4 is eight bytes (a few bits of Data3 and the first part of Data4 are reserved for version information, but that's more or less the structure). Most GUID algorithms in use today, and especially those used by the .NET Framework, are pretty much just fancy random number generators (Microsoft used to include the local machine's MAC address as part of the GUID, but discontinued that practice several years ago due to privacy concerns). This is good news for us, because it means that playing around with different parts of the value is unlikely to damage the value's uniqueness all that much. But unfortunately for us, different databases handle GUIDs in different ways. Some systems (Microsoft SQL Server, PostgreSQL) have a built-in GUID type which can store and manipulate GUIDs directly. Databases without native GUID support have different conventions on how they can be emulated. MySQL, for example, most commonly stores GUIDs by writing their string representation to a char(36) column. Oracle usually stores the raw bytes of a GUID value in a raw(16) column. It gets even more complicated, because one eccentricity of Microsoft SQL Server is that it orders GUID values according to the least significant six bytes (i.e. the last six bytes of the Data4 block). So, if we want to create a sequential GUID for use with SQL Server, we have to put the sequential portion at the end. Most other database systems will want it at the beginning. But how exactly do we create a sequential GUID? Exactly which part of it do we keep "random," and which part do we replace with a timestamp? Well, the original COMB specification, tailored for SQL Server, replaced the last six bytes of Data4 with a timestamp value. This was partially out of convenience, since those six bytes are what SQL Server uses to order GUID values, but six bytes for a timestamp is a decent enough balance. That leaves ten bytes for the random component. We use RNGCryptoServiceProvider to generate our random component because System.Random has some deficiencies that make it unsuitable for this purpose (the numbers it generates follow some identifiable patterns, for example, and will cycle after no more than 232 iterations). Since we're relying on randomness to give us as much of a guarantee of uniqueness as we can realistically have, it's in our interests to make sure our initial state is as strongly random as it can be, and RNGCryptoServiceProvider provides cryptographically strong random data. Okay, we now have the random portion of our new value, and all that remains is to replace part of it with our timestamp. We decided on a six-byte timestamp, but what should it be based on? One obvious choice would be to use DateTime.Now (or, as Rich Andersen points out, DateTime.UtcNow for better performance) and convert it to a six-byte integer value somehow. The Ticks property is tempting: it returns the number of 100-nanosecond intervals that have elapsed since January 1, 0001 A.D. However, there are a couple hitches. First, since Ticks returns a 64-bit integer and we only have 48 bits to play with, we'd have to chop off two bytes, and the remaining 48 bits' worth of 100-nanosecond intervals gives us less than a year before it overflows and cycles. This would ruin the sequential ordering we're trying to set up, and destroy the performance gains we're hoping for, and since many applications will be in service longer than a year, we have to use a less precise measure of time. The good news is, those two hitches sort of cancel each other out: the limited resolution means there's no point in using the entire Ticks value. So, instead of using ticks directly, we'll divide by 10,000 to give us the number of milliseconds that have elapsed since January 1, 0001, and then the least significant 48 bits of that will become our timestamp. I use milliseconds because, even though DateTime.UtcNow is currently limited to 10-millisecond resolution on some systems, it may improve in the future, and I'd like to leave room for that. Reducing the resolution of our timestamp to milliseconds also gives us until about 5800 A.D. before it overflows and cycles; hopefully this will be sufficient for most applications. Before we continue, a short footnote about this approach: using a 1-millisecond-resolution timestamp means that GUIDs generated very close together might have the same timestamp value, and so will not be sequential. This might be a common occurrence for some applications, and in fact I experimented with some alternate approaches, such as using a higher-resolution timer such as System.Diagnostics.Stopwatch, or combining the timestamp with a "counter" that would guarantee the sequence continued until the timestamp updated. However, during testing I found that this made no discernible difference at all, even when dozens or even hundreds of GUIDs were being generated within the same one-millisecond window. This is consistent with what Jimmy Nilsson encountered during his testing with COMBs as well. With that in mind, I went with the method outlined here, since it's far simpler. Now we have our timestamp. However, since we obtained the bytes from a numeric value using BitConverter, we have to account for byte order. We have the bytes for the random portion of our GUID, and we have the bytes for the timestamp, so all that remains is to combine them. At this point we have to tailor the format according to to the SequentialGuidType value passed in to our method. For SequentialAsBinary and SequentialAsString types, we copy the timestamp first, followed by the random component. For SequentialAtEnd types, the opposite. So far, so good. But now we get to one of the eccentricities of the .NET Framework: it doesn't just treat GUIDs as a sequence of bytes. For some reason, it regards a GUID as a struct containing a 32-bit integer, two 16-bit integers, and eight individual bytes. In other words, it regards the Data1 block as an Int32, the Data2 and Data3 blocks as two Int16s, and the Data4 block as a Byte. What does this mean for us? Well, the main issue has to do with byte ordering again. Since .NET thinks it's dealing with numeric values, we have to compensate on little-endian systems -- BUT! -- only for applications that will be converting the GUID value to a string, and have the timestamp portion at the beginning of the GUID (the ones with the timestamp portion at the end don't have anything important in the "numeric" parts of the GUID, so we don't have to do anything with them). Here are a few examples generated by our new method. As you can see, the first six bytes (the first two blocks) are in sequential order, and the remainder is random. Inserting these values into a database that stores GUIDs as strings (such as MySQL) should provide a performance gain over non-sequential values. As we'd expect, the last six bytes are sequential, and the rest is random. I have no idea why SQL Server orders uniqueidentifier indexes this way, but it does, and this should work well. When viewed here in the format ToString() would output, we can see that something looks wrong. The first two blocks are "jumbled" due to having all their bytes reversed (this is due to the endianness issue discussed earlier). If we were to insert these values into a text field (like they would be under MySQL), the performance would not be ideal. This is how an ORM framework would most likely generate INSERT statements for an Oracle database, for example, and you can see that, when formatted this way, the sequence is again visible. So, to recap, we now have a method that can generate sequential GUID values for any of three different database types: those that store as strings (MySQL, sometimes SQLite), those that store as binary data (Oracle, PostgreSQL), and Microsoft SQL Server, which has its own bizarre storage scheme. We could customize our method further, having it auto-detect the database type based on a value in the application settings, or we could create an overload that would accept the DbConnection we're using and determine the correct type from that, but that would depend on the details of the application and any ORM framework being used. Call it homework! 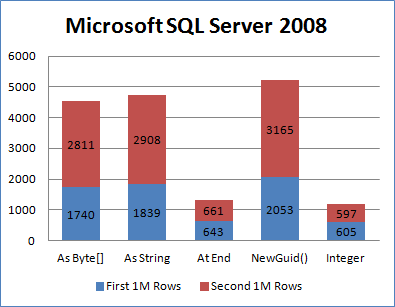 For SQL Server, we would expect the SequentialAtEnd method to work best (since it was added especially for SQL Server), and things are looking good: GUID inserts using that method are only 8.4% slower than an integer primary key -- definitely acceptable. This represents a 75% improvement over the performance of a random GUID. You can also see that the SequentialAsBinary and SequentialAsString methods provide only a small benefit over a random GUID, also as we would expect. Another important indicator is that, for random GUIDs, the second millions inserts took longer than the first million, which is consistent with a lot of page-shuffling to maintain the clustered index as more rows get added in the middle, whereas for the SequentialAtEnd method, the second million took nearly the same amount of time as the first, indicating that new rows were simply being appended to the end of the table. So far, so good. 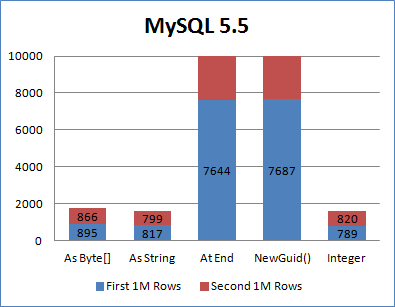 As you can see, MySQL had very poor performance with non-sequential GUIDs -- so poor that I had to cut off the top of the chart to make the other bars readable (the second million rows took over half again as long as the first million). However, performance with the SequentialAsString method was almost identical to an integer primary key, which is what we'd expect since GUIDs are typically stored as char(36) fields in MySQL. Performance with the SequentialAsBinary method was also similar, probably due to the fact that, even with incorrect byte order, the values are "sort of" sequential, as a whole. Oracle is harder to get a handle on. Storing GUIDs as raw(16) columns, we would expect the SequentialAsBinary method to be the fastest, and it is, but even random GUIDs weren't too much slower than integers. Moreover, sequential GUID inserts were faster than integer inserts, which is hard to accept. 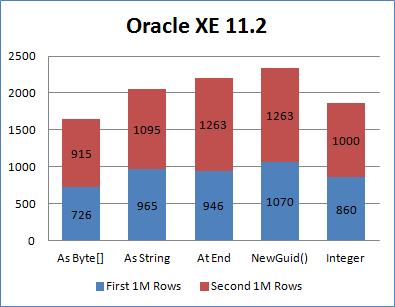 While sequential GUIDs did produce measurable improvement in these benchmarks, I have to wonder if the weirdness here is due to my inexperience with writing good batch inserts for Oracle. If anyone else would like to take a stab at it, please let me know! And finally, PostgreSQL. Like Oracle, performance wasn't horrible even with random GUIDs, but the difference for sequential GUIDs was somewhat more pronounced. As expected, the SequentialAsString method was fastest, taking only 7.8% longer than an integer primary key, and nearly twice as fast as a random GUID. There are a few other things to take into consideration. A lot of emphasis has been placed on the performance of inserting sequential GUIDs, but what about the performance of creating them? How long does it take to generate a sequential GUID, compared to Guid.NewGuid()? Well, it's definitely slower: on my system, I could generate a million random GUIDs in 140 milliseconds, but sequential GUIDs took 2800 milliseconds -- twenty times slower. Some quick tests showed that the lion's share of that slowness is due to the use of RNGCryptoServiceProvider to generate our random data; switching to System.Random brought the result down to about 400 milliseconds. I still don't recommend doing this, however, since System.Random remains problematic for these purposes. However, it may be possible to use an alternate algorithm that's both faster and acceptably strong -- I don't know much about random number generators, frankly. Is the slower creation a concern? Personally, I find it acceptable. Unless your application involves very frequent inserts (in which case a GUID key may not be ideal for other reasons), the cost of occasional GUID creation will pale in comparison to the benefits of faster database operations. Another concern: replacing six bytes of the GUID with a timestamp means only ten bytes are left for random data. Does this jeopardize uniqueness? Well, it depends on the circumstances. Including a timestamp means that any two GUIDs created more than a few milliseconds apart are guaranteed to be unique -- a promise that a completely random GUID (such as those returned by Guid.NewGuid()) can't make. But what about GUIDs created very close together? Well, ten bytes of cryptographically strong randomness means 280, or 1,208,925,819,614,629,174,706,176 possible combinations. The probability of two GUIDs generated within a handful of milliseconds having the same random component is probably insignificant compared to, say, the odds of the database server and all its backups being destroyed by simultaneous wild pig attacks. One last issue is that the GUIDs generated here aren't technically compliant with the formats specified in RFC 4122 -- they lack the version number that usually occupies bits 48 through 51, for example. I don't personally think it's a big deal; I don't know of any databases that actually care about the internal structure of a GUID, and omitting the version block gives us an extra four bits of randomness. However, we could easily add it back if desired. // of the Data1 and Data2 blocks on little-endian systems. As I mentioned at the beginning, the general COMB approach has been used fairly heavily by various frameworks, and the general concept isn't particularly new, and certainly not original to me. My goal here was to illustrate the ways in which the approach has to be adapted to fit different database types, as well as to provide benchmark information underscoring the need for a tailored approach. With a little effort and a moderate amount of testing, it's possible to implement a consistent way of generating sequential GUIDs that can easily be used as high-performance primary keys under pretty much any database system. v1 - Wrote the thing! v2 - Adopted Rich Andersen's suggestion of using DateTime.UtcNow instead of DateTime.Now, for improved performance and updated code formatting. Jeremy Todd is a database administrator and lead web programmer for the College of Agricultural, Communications, and Environmental Sciences at the University of Illinois at Urbana-Champaign. He enjoys work, fun, and talking about himself in the third person. Performance comparison of your method with UuidCreateSequential method of rpcrt4.dll for sql server database? And which one would you propose? I am looking for this functionality but do not understand how to plug it in to the access db I am working with. Is it possible to have this generate from a VBA call? FYI the project I am on is quickly getting moved to MSSQ after the design can get hammered out. Why would you want to store the GUID as a CHAR(32) in MySQL rather than as a BINARY(16)? See article by Ed Gibbs on GUID Values as Primary Keys. Very good article, but applies to some DB engines only. Oracle generate it's own ROWID Pseudocolumn. Even if you have a sequential key, the rows may not be stored sequentially. So the performance is not affected by the order of primary keys. Oracle creates an index for the primary key. I do not know how the order of primary keys affect the performance of the index, but from your benchmarks I guess it has no effect, too. SQLite generate it's own integer ROWID for primary key columns that are not integer. So I think the performance is also not affected when a random GUID is used as a primary key. Sorry to revive this old thread, but I am having second thoughts about this method. It relies on a computer clock working properly and a time stamp which always increments. Last month we had the case that a Windows 2003 server of ours didn't fire any scheduled tasks anymore. Somehow it just broke. Upon closer examination, it turned out that the computer clock was 4 hours early! The minutes and seconds were accurate, though, which was puzzling to say the least. The time zone on this machine was set correctly and the automatic DST correction was still a month away so we couldn't blame that either. So what the heck was wrong? It turned out that this computer was configured to regularly retrieve the time from an internet NTP server. Our best guess is that somehow that NTP server must have had a glitch (maybe someone set its time zone wrong) so our computer had its time adjusted 4 hours backward by mistake. Anyway, this has confused the Windows task scheduler to a degree that it just didn't work anymore. After a re-boot the server was OK again. What I'm trying to say is that time corrections *will* happen whether they are intentional or not. If the time correction is as massive and also negative like the one we experienced, then I think your GUID algorithm may have a problem if you require a high throughput. Since we would effectively be "replaying" a large time interval, the probability of generating a duplicate Guid would also increase if you require a sustained large throughput. What's you opinion on this? I want to check performance(Speed, Space used, etc) of My Primary Indexing Technique. I also need to compare it with existing Indexing technique. 1) Is it possible to do this in MySQL or MsSQL(or any open source DBMS software)? I need to know how? 2) & Can you suggest me Good Profiling Soft-wares for Testing & Comparison purpose? so I can put my code in it & check the performance of My Primary Indexing Technique & compare with existing Technique. Kindly reply with any information you have about tools/Software that can help me. a good approach, well explained. On another topic, my application does several bulk inserts of small amount of data and I have noticed that a couple of the GUID generated do indeed have the same sequential bytes. My understanding is that it would only affect the performance of insertion into the database and not causing any collision or improper sorting of the actual data. Am I right in this assumption? 1. I haven't used WinRT myself, but from reading the documentation I don't think CryptographicBuffer.GenerateRandom() should be a problem, as long as the performance is acceptable to you. 2. Inserting several GUIDs with the same sequential portion shouldn't be a problem, although it does mean that you can't assume the clustered index contains the rows in the exact order they were inserted (even though this will be mostly true). You'd think that the lack of a strict sequence would affect INSERT performance somewhat, but from all the tests I've run that just doesn't seem to be the case -- I've talked about this a little bit in some of the other comments. Collisions shouldn't be an issue unless you're generating a truly astronomical number of GUIDs in a single batch. If the fate of the entire world rested on my application I might go another direction, but short of that I don't think it would ever be an issue. As for your question about "improper sorting of the actual data," if you mean the results of a SQL ORDER BY on other columns, then no, it shouldn't have any effect at all. The only tricky point might be what I said above: since the clustered index isn't strictly sequential, you can't rely on it to determine the exact insert order of rows, so if that's what you want then you'll need to have some other way of tracking it. Any suggestions as to how to retrofit this to an existing SQL Server database? We currently use standard GUIDs and have thousands of records with them. If we start with your solution now it's probable that the new sequential GUIDs won't fall at the end of the current GUID sequence. We'd have to change existing ones to sequential GUIDs, don't you think? This wouldn't be perfect, but it could reduce the amount of reshuffling needed and it might improve performance, at least a little. I think it would depend on the details of the table (number of rows, maybe the sparsity of the data file -- I'm not well-versed enough on the internals of SQL Server to be sure). This would also reduce the resolution of the timestamp, though, so you'd probably want to make changes there: if you simply modify my code to replace the first byte of the timestamp with 0xff, it looks like the timestamp would cycle over in about 8 or 9 years, destroying the sequence. It's tempting to think that your database might not be around after that amount of time, but I'm always surprised by how long mine seem to last. If inserts to your database are infrequent, you could simply right-shift the timestamp by one byte. This would give it a resolution of about one-quarter of a second, but it wouldn't cycle for many many years. Or, you could keep the current resolution, but start counting from the current date so that the timestamp begins with ff0000000000 instead of ffc0c3e9d8c0 the way it would now, and buy yourself a couple of decades. I think this would reduce any performance gain, though, since you want new inserts to be as close to the end of the clustered index as possible, and this would move them a little "further back." Still, I'd recommend replacing your existing IDs if it's at all practical. Very interesting article. I made some tests with SQLite and its .NET provider (1.0.84). Everything was running in one big transaction on a Core i5 laptop with a standard hard disc. Thanks for the data! I think you might be running into some performance problems using BLOB as your key type, though. I don't have a lot of experience with SQLite and I don't know how it stores things internally, but usually BLOBs can't be indexed effectively (because the actual data usually resides in a separate location, with only a "pointer" stored as part of the row itself), and so a clustered index on a BLOB type is probably doing a lot of reshuffling. I think that might be why you're seeing a big difference between the first and second million inserts -- ideally, the performance should be roughly the same no matter how many inserts you perform. You might try switching to BINARY(16) or CHAR(36) and trying again. I think you misinterpreted the timings - they're running totals. So in case of your Guids the insertion time is linear. Actually I also ran the tests with the PK column defined as type TEXT. The resulting file size was 427 MB compared to 301 MB with a PK column of type BLOB. As there are only five underlying types in SQLite (TEXT, REAL, INTEGER, BLOB, NULL) CHAR(36) internally maps to TEXT and BINARY(16) maps to BLOB. But I must admit that for retrieving data via PK, TEXT type is definitely more convenient. Ah, that makes more sense. Sorry for misunderstanding! Like I said, my experience with SQLite is very limited -- I've only used it for trivial applications so far. This is one way non-SQL people fake pointer chains to avoid RDBMS. The GUID was never meant for this purpose. If you don't mind going into more detail, could you explain your practical objections to this method? It solves an increasingly common problem in data-driven applications without much of a performance hit. Under those circumstances, I don't think original intent alone is enough reason to dismiss it. Alternatively, what would your recommendation be for avoiding key collisions in ORM or distributed applications? I've been using this for a while now - and it's a work of art. Kudos to the author! I was stumbling around trying to make a decision on what to use for my system...this article made things very clear. Proposed bytes order are not correct. Generated bytes are not sequential. That's why benchmark tests are so strange. first, thank you for great work. But I want to point you some problems. In our company we have ORM with GUID ID's, which can connect to different DBMSes. So we studied this problem before. So, your code is correct only if you fill GHIJKLMNOP with random data AND generate only one Guid per system clock tick (second is not true for your benchmark tests - between two different values of DateTime.Now tonns of Guids (for example near 11000 Guids on my computer) can be generated, and random data is not ordered). So values your generated was not sequental and in fact databases tried to insert several thousands of not-sorted Guids, then next several thousands and so on. So in fact you have measured DBMS'es possibility to insert packs of thousands unordered Guids, not sequential Guids as you want. 1) Several bytes (at least 4 bytes) as counter, starting from zero or any other value (recommend init with random value). Each time you generate new Guid, value increased (such way is done in our ORM (it's our internal product, it's neither for sale nor source code can be published)) and even if DateTime.Now returned same value, you will guarantely have sequential Guids (bytesthat are neither datetime nor counter left random to protect from collisions with other connections). 2) more Array.Reverse operations should be added for Guids two be identically ordered in different DBMSes. 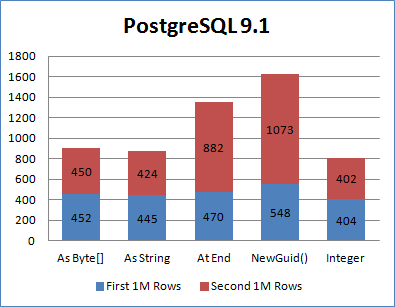 3) Check significant bytes for Oracle, PostgreSQL - may be unclear results for them caused by other significant bytes scheme than you used (not just byte as you proposed, but something strange like in MS SQL). Sorry but on my computer I don't have them installed and can't test by myself. I think this information will have to improve the article. May be re-run benchmark tests after changes will be more predictable (If you want, you can use any information provided by me in your article). Re: Proposed bytes order are not correct. Generated bytes are not sequential. That's why benchmark tests are so strange. Thanks so much for your feedback! I'm sorry I didn't get back to you sooner, somehow I missed the notification e-mail. You're right that my method can potentially result in batches of hundreds or even thousands of records being inserted non-sequentially, and that concerned me at first too (there's a paragraph about it in the article). In fact, I experimented with different schemes, including counters and higher-resolution timers, to try to avoid this very problem. I'm curious if you ran any benchmarks to compare performance with and without a counter, though? Because for me, the problem just never materialized: adding a counter provided no real benefit, and it turned out that inserting batches of even 1000+ records with the same timestamp had no significant effect on performance at all, on any of the RDBMSes I tried. I even tried to maximize the potential performance hit by pre-generating lists of GUID values as close together as possible, so that many would have the same timestamp. Looking at my test files, it looks like the average timestamp value has several hundred GUIDs associated with it -- the best my underpowered desktop could do, I guess. But in the end, I decided to just trust the experimental data. Even though the concerns you raise are perfectly reasonable-sounding, I just couldn't find any evidence of a real-world effect, and so implementing a counter would be a premature optimization, especially since it would reduce the resolution of either the timestamp or the random portions. Adding a counter also complicates the algorithm and introduces some basic threading concerns, and I wanted to keep the article fairly straightforward. Also, I'm not sure I'm following your objection to the byte order. Can you explain in a little more detail, especially why you think additional Array.Reverse() operations are necessary? The "DCBA-FE-HG-JI-KLMNOP" order you notice for binary(16) fields doesn't reflect strange ordering of binary data by the database system itself, but simply the endianness of the components of the .NET Guid type and the quirky way .NET renders Guids to/from strings. Whether you need to reverse sections of the GUID byte data depends on how your ORM framework generates INSERT queries for GUIDs: whether it uses Guid.ToString() to write to a char(36) column, or Guid.ToByteArray() to grab the bytes and then write that as a hex string to a binary(16) column, or some other method. I think the assumptions I made should be valid for the most common use cases, but your mileage may vary. I'd really like to fix any problems and make my code more portable, though. Can you give an example (specifying the database system, column type, and which of my three methods you used) of when GUIDs generated by my code wouldn't have the correct sequence? Actually moving the placement of records within the page doesn't cause the delay inserting records. Maintaining records with a 60% fill factor where the data has a limited life span is EXTREMELY fast with the random order newid() generates. Long term storage causes problems because the random insert of records into the page causes page splits. That moves one page into two new ones in a completely different segment when the original segment had 8 filled pages, so now the server has to read three segments to retrieve the same information that was in one. Since they are randomly ordered, reading from three different segments isn't that much more of a problem. The fragmentation of the internal structure causes both storage and lookup problems. Mapping how a binary field correlates to a guid is fairly simple. Mapping how a guid is ordered is another. I can tell the last 6 bytes listed are the first ones used in sorting so making ticks the last 8 bytes would make it determine the order of a guid while making them the first 8 bytes of a binary(16) field would determine the order of that field type. If there are any folks that are worry about optimization, I would suggest using DateTime.UtcNow instead of DateTime.Now (DateTime.Now is very slow) and using Guid.NewGuid() instead of RNGCryptoServiceProvider (as discussed in prior threads with a word of caution from our author). Using DateTime.UtcNow is a great suggestion, thanks! And yeah, I use Guid.NewGuid() myself for practical purposes. I just didn't want to recommend it generally because there's no guarantee Microsoft (or the Mono folks) won't change the implementation at some point in the future.